Whoever said “Real men eat red meat” didn’t taste a burger made by Engine 2, the company founded by Rip Esselstyn, the former fireman whose been on a “plant-strong” diet since 1987. With the firm belief that a burger doesn’t have to be made from red meat, two superstars – Engine 2 and Whole Foods – got together to come up with great tasting, healthy plant-based burgers. Gluten-free with no cholesterol or saturated fat, Engine 2 Plant-Stroong Plant Burgers are flavorful and make one mean burger. 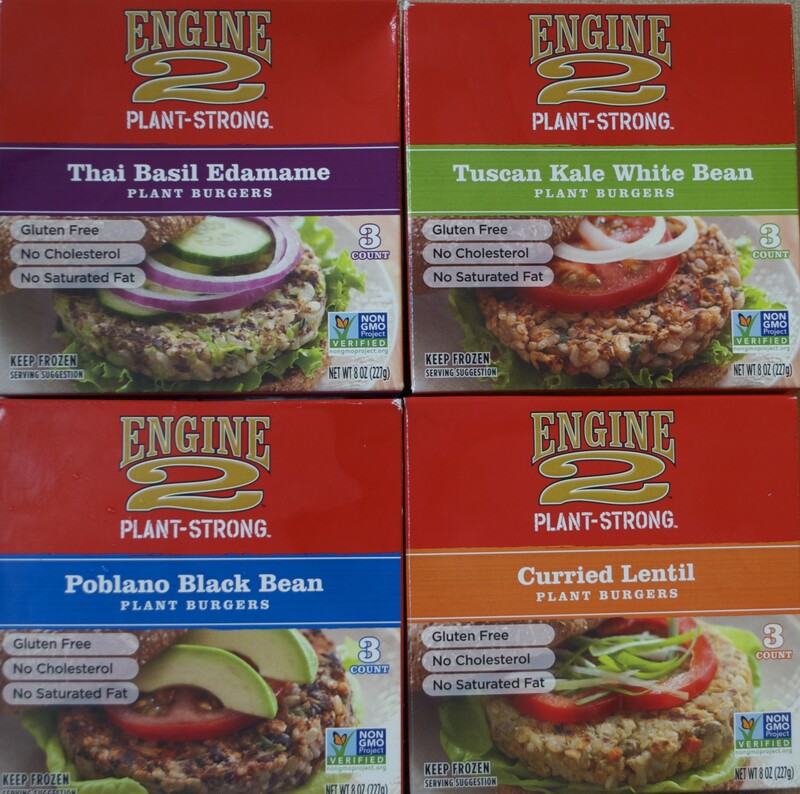 Engine 2 makes four different types of Plant Burgers: Poblano Black Bean, Curried Lentil, Thai Basil Edamame, Tuscan Kale White Bean. Each burger is bean, grain, or vegetable based with recognizable nutritious ingredients: black beans, cooked brown rice, tomatoes, rolled oats, pumpkin seeds, cilantro, cumin, black pepper, coriander, kale, garlic, roasted red peppers, flax seeds, basil, ginger, onion powder, sweet potatoes, almond milk, curry powder, carrots, hemp seed and more. What differentiates these burgers from other frozen vegan burgers is the texture (firmer with a crunch depending on how long the burger is cooked stove top) and the taste. A firm burger that goes from the freezer to the bun in less than 10 minutes, Engine 2 Plant Burgers are delicious on a whole grain bun with lettuce, tomato, red onion, and avocado. A single Plant Burger is about 120-130 calories and has 4-6 grams of protein, 1.5-2.5 grams of fat, 1-4 grams of sugar, 3-5 grams of fiber, and 15 – 100 mg of sodium. Each box contains 3 burgers and sells for about $5 in the frozen food section at Whole Foods. For more information on the Engine 2 Plant Burgers, go to Engine 2’s website: www.engine2diet.com.